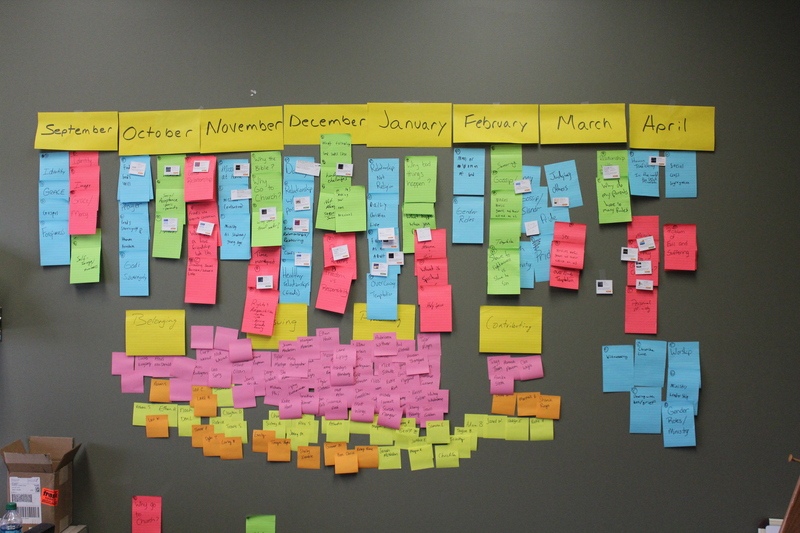 Every year, this is how we plan our curriculum for the next year. It’s all laid out in advance but, of course, we make changes as needed when something comes up that needs to be addressed right away. Clear off some wall space. Put the names of our four Spiritual Journey categories (Belonging, Pursuing, Practicing, Contributing) on large sticky notes and place them on the wall across middle of the wall, left to right. Put the names of our students on sticky notes (yes, all of them). Place these names on the wall below the categories appropriate to where we think each student is on their spiritual journey. This is a long process so we need to allow plenty of time. Take some time to talk about where the kids are, noting their common groupings, their needs, their potential, etc. Brainstorm topics and studies we think would speak to where the kids are at or that would help the kids take a step forward and write them on larger sticky notes with separate colors for each age group and place them below the category where the topic is best categorized (above Belonging, Pursuing, Practicing, Contributing). Rearrange all the topics we put up into same-colored groupings of similar topics, subjects, or could be in a common series. 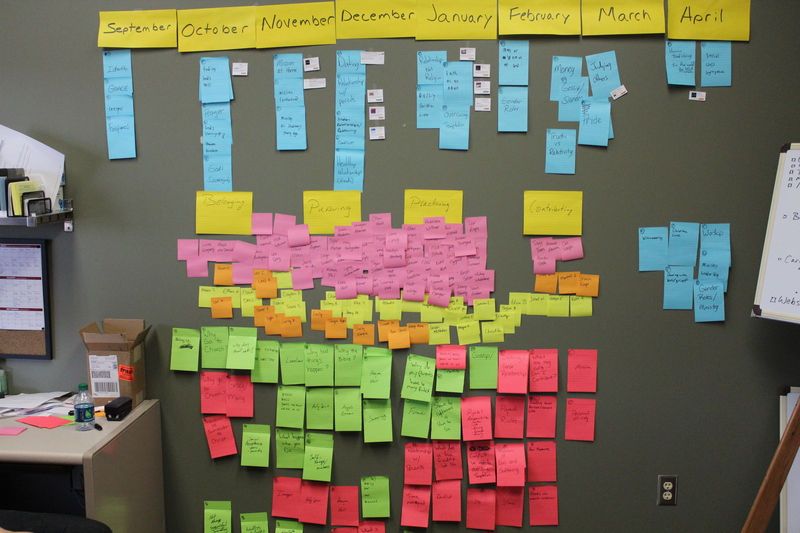 Write the months of the school year (September through May) on large sticky notes and place them on the wall above everything in order from left to right. Rearrange all the topic groupings, placing them up in the calendar year according to the “seasons” we think they’d be most helpful. For example, Understanding the Will of God for Varsity goes best during the “late fall” when students are starting to think about college applications and careers. A series about mission and serving others might fit best for both JV and Varsity in April around our denomination’s annual urban ministry weekend in Minneapolis. Search our curriculum resources for series and studies that most closely match the topical groupings we’ve created. We use Orange’s XP3 as our base curriculum which is typically grouped into 2-4 week series. But, we also use re:Form from Spark House and a variety of video studies and resources from RightNowMedia. Additionally, we sometimes write our own depending on the needs of our context. Then we print the series title graphics, cut them out and taped them to the correlating grouping. It’s best for us to use curriculum that’s already written if possible. Writing our own takes way too much time and energy and it’s often not written till just the week before. We need the content to be in our communicators’ hands a lot further in advance and in our small group leaders’ hands one full week in advance. Besides, there are some really great thinkers out there who are writing and creating some good stuff. Yes, we always end up tweaking it or changing it a bit. But starting with a curriculum makes the planning and implementing a lot easier and it opens up a lot more mental space for us to tackle other issues like community building, assimilation/retention, crisis response, coaching, etc. Then, it’s best to enter it all into a spreadsheet so you can refer back to it throughout the year and keep track of where you headed next. Now, we get to evaluate how we’ve done and what kind of growth we’ve seen in the kids at the end of the school year. Our final small group leaders meeting will be Saturday morning, April 26. At that meeting we’ll have them submit their assessments of where the kids are now and where they were at the beginning of the school year. Hopefully, we’ll be able to celebrate see some forward progress and establish our goals for the kids for the next year. Well, that’s what we do. What do you think?